As I work on analysing the 2017 Local Election and Metro-Mayor results with the BBC Team, I will be trying to pull out some interesting stories which might tell us something about the upcoming General Election on June 8th. 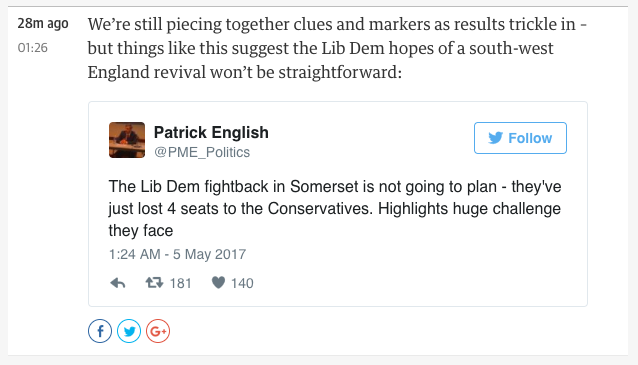 Early on, I spotted a trend of Liberal Democrat loses in Somerset - old South-West heartlands for the party where, if a Lib Dem Fightback is forthcoming, then it should be detectable there. The Liberal Democrats and the Conservatives did end up trading seats somewhat on the Council, but overall once Somerset had declared, the Liberal Democrats found themselves 6 seats down despite their vote share increasing by nearly 5% (on 2013). What happened in Somerset is indicative of the struggles that the Lib Dems will face in between now and June 8th in kicking the engine into gear of their much-discussed comeback: they have increased their vote share, but the Conservatives have passed them at 100 miles per hour on the outside by mopping up UKIP votes (who, incidentally are absolutely crashing nationwide) and going even further ahead (and in some cases taking Lib Dem seats even when they increased their own vote share). A similar thing happened in Gloucestershire County Council - the Liberal Democrats increased their vote share by 6.5%, but made 0 gains in terms of seats (conversely, the Conservatives took an extra 8 seats to gain overall control of the Council). What can we read from this in terms of the upcoming General Election? To put it simply, the Liberal Democrats might increase their vote share in the South West by say 5%, but the Conservatives will go up 10%. This does not translate into General Election seat wins. Lib Dems need a swing from the Conservatives to them, not for the Conservatives to go further ahead. So something of a Lib Dem fightback could be on in terms of vote shares in the South West, but winning seats looks like a whole other ball game which appears to be out of reach so long as the Conservatives continue to hoover up UKIP voters. This very much puts the brakes on the Lib Dem fightback in the South West.